The Ruby Circle by Richelle Mead was an amazing conclusion to a wonderful series! I have such a big love for her Bloodlines series, The Ruby Circle did not disappoint! The novel was ingenious, racing, and emotional, it was definitely one of the best books in the series. I recommend you to pick up the Bloodlines series if you have not already! 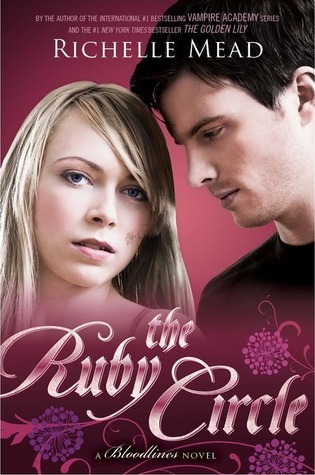 In The Ruby Circle, there is so much at risk for Sydney and Adrian *spoilers* After Sydney escapes the Alchemist's re-education center and gets married to Adrian, the love of her life, Jill is suddenly kidnapped and their lives are turned upside down. I love how the novel integrates all of the amazing characters from the Bloodlines series, from Marcus to Dmitri and Rose to Olive and Nina, Mead managed to weave such a complex story line. She also kicks up the action and suspense with Nina's sister Olive in trouble with spirit magic to Sydney's rescue mission with Jill, alongside with Mrs. Terwillinger and her coven, it was magic seeing it come in full circle. Sydney and Adrian were both amazing in The Ruby Circle, they are both tested to the max emotionally and physically and readers see parts of them never seen in the previous books. The dual POV was done flawlessly! I never had trouble figuring out who was what and it just brought the book together. Sydney is as clever and igneous as before and Adrian grows so much and matures since his drunken, artist persona in the first few novels. The ending of the novel put such a big smile on my face :) It was everything I hoped for it to be and more. It was definitely a feel good ending and after reading the Bloodlines series I've grown with the characters. Ultimately, The Ruby Circle was the best book in the Bloodlines series. It went beyond my expectations and blew me away. If you have not picked up the series, be sure to do, you will not regret it!